The intense heat of July, 2010 (several days of 100+ degrees in the Fan) has made us aware of the cooling effects of shade and the necessity of maintaining a consistent tree canopy for the Fan District’s streets. Drought and heat have caused great stress to many of our trees resulting in the likely death of a significant number of old friends. Winged elms especially have been weakened by the weather and made more susceptible to elm disease. Numerous winged elms throughout the neighborhood will die within the next several months and will require replacement with a more durable species. The dying elm on N. Allen Avenue, sadly, is becoming a common scene along our streets (fig. 1). Residents are urged to utilize the Adopt-A-Tree program to ensure the planting of new trees in the coming fall, winter, and early spring. In so doing, it is important to consider what species will flourish in urban conditions and maintain the tree canopy of our streets. 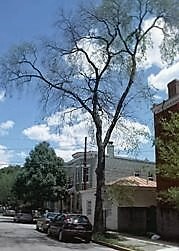 Not recommended are sugar maples as Richmond is outside their natural zone, and sidewalk tree wells do not allow sufficient moisture penetration for these water-hungry trees to grow to adequate height and age. 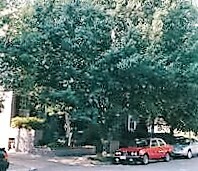 Sugar maples were once the preferred Fan street tree, but hotter, dryer summers have resulted in many of these maples becoming weak and stunted. 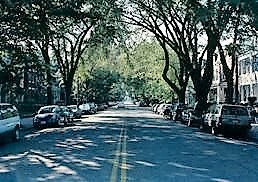 Note the picture of Stuart Avenue where most of the street trees are maples but no over-arching tree canopy has been achieved (fig. 2). 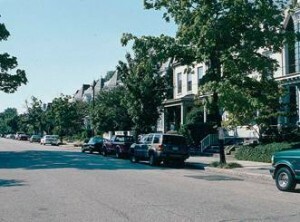 In the picture of Floyd Avenue, we see what a difference a tree canopy makes to character of a street (fig. 3). Sadly, a number of these trees have been lost since this photo was taken. Ginkgo trees have become popular because of their ability to thrive in and urban environment. Although they are tough trees, they grow relatively slowly and irregularly and do not have the type of spread that will make for an effective canopy. Note the spindly profile of the ginkgo trees on Grove Avenue in the Museum District (fig. 4). A tree definitely not recommended is the once-popular Bradford pear. Bradfords grow very quickly but their foliage is so dense that the trees mask the Fan’s distinctive architecture for much of the year. In addition, because Bradford’s do not have a main center trunk, they are prone to splitting in ice and snow. Note the photo of two Bradford pear trees completely hiding the houses and offering unsatisfactory shade (fig. 5). Although we may like the early spring bloom of a Bradford, the bloom hardly lasts more than a week. The sugar maple, ginkgo, and Bradford pear are three trees to avoid as replacement street trees. See Part 2 suggestions for species that promise good potential for ensuring our shade for our streets.